Most Rev. Roger Joseph Foys, D.D. Roger Joseph Foys was born on July 27, 1945 in Chicago, Illinois. He began his studies for the Diocese of Steubenville at St. John Vianney Seminary in Bloomingdale, Ohio, part of the Franciscan University of Steubenville. He completed his graduate studies at the Catholic University of America in Washington, D.C. and the Pontifical Gregorianum in Rome. Father Foys was ordained a priest on May 16, 1973 by Bishop John King Mussio in Holy Name Cathedral, Steubenville. As a priest, he held many positions in the diocese. Over the years he served as Diocesan Treasurer, Chairman of the Diocesan Presbyteral Council and Moderator of the Curia, as well as in several capacities in the Diocesan Tribunal. In 1982 he was appointed Vicar General of the diocese and made a monsignor in 1987. He spent one year teaching Canon Law at St. John Vianney Seminary. During his priestly ministry he also served as pastor of a number of parishes. He was Director of Vocations and always showed a great interest in promoting vocations. Pope John Paul II made him a Prelate of Honor in 1986 and a Protonotary Apostolic in 2001. Msgr. 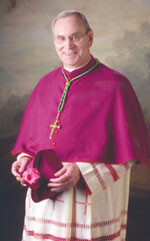 Foys was appointed Bishop of Covington on May 31, 2002, and was ordained and installed at the Cathedral Basilica of the Assumption on July 15, 2002.